China's economic expansion slowed during the third quarter of the year as government measures to control inflation hurt growth. China's economy grew by 9.1% in the three months to the end of September from a year earlier, down from 9.5% in the previous quarter. The data comes amid fears that a slowdown in the US and Europe's debt crisis may also hurt China's growth. China is the world's second-largest economy. "The national economy generally carried good development state and kept moving towards the expected direction of macroeconomic control," the National Bureau of Statistics said in a statement. China has witnessed robust growth in past few years. But the rapid expansion has come at a price. Consumer price inflation in the country has been above the central bank's target and there have been concerns of the formation of asset bubbles. Chinese authorities have been targeting the country's inflation rate and the surge in property prices by tightening credit markets. The central bank has increased interest rates five times in the past year and has also raised the reserve ratio requirement for banks regularly, thus reducing the amount of money they can lend. Analysts said that while the measures have helped to contain price growth, they have curbed growth. "We are seeing a broad slowdown through the year," said Alistair Thornton, China analyst at IHS Global Insight. "The tightening measures they have put in place over the last year have had an impact, and growth has slowed as a consequence," said Mr Thornton. 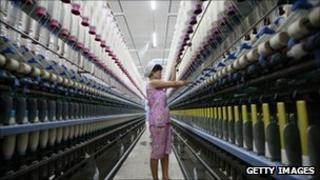 Data released on Tuesday showed that factory output in China grew by 18% in September from a year earlier. Though the figure was higher than the previous month, analysts said that China's export-led growth may slowdown further in the coming months. There have been concerns that the debt crisis in Europe may hurt growth in the region and dent consumer demand. Media caption"Most of China's growth is coming from domestic investment," says Warren Hogan, ANZ Bank. That is likely to have a big impact on China's export sector as the European Union is the world's biggest purchaser of Chinese goods, with the market worth about $380bn (£241bn) in 2010. These fears were fanned further after data out last week showed that China's annual rate of export growth weakened to 17.1% in September, down from 24.5% the previous month. Analysts said that developments in Europe are likely to have a big impact on China's economy. "The trajectory of the Chinese economy in the next 18 months will be wholly reliant on the trajectory of European growth," said Mr Thornton from IHS. "If things don't quite go to plan in Europe, then we could be faced with a similar situation to 2008-2009." While there are concerns that a slowdown in external demand may hurt growth, some analysts said growing domestic demand may help China offset any such falls. China's economic growth has seen the rise of a more affluent middle class with higher disposable incomes, which is likely to boost demand. At the same time, China has been trying to boost demand at home in a bid to rebalance its economy. Warren Hogan, chief economist of ANZ Bank told the BBC's Asia Business Report that domestic consumption was playing a key role in China's growth. "Gross domestic product (GDP) figures today should send a message to the broader community that the Chinese economy is largely a domestic economy," he said. "Most of this growth is coming from domestic investment and consumption," he added.